These radial master cylinders from ISR really are a work of art! Machined from billet aluminium and incorporating many unique design features, these work as good as they look. The adjustable lever ratio means that you can tailor the feel of your front brakes exactly to suit your preference. 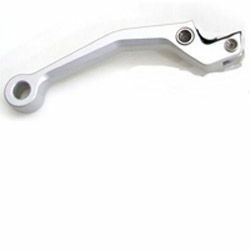 The ingenious design means that these can be used as either a front brake or clutch master cylinder - simply un-bolt the lever assembly and spin round to suit - and in a race crash damage situation this can also mean that the lever assembly can often be replaced without disconnecting the brake line or bleeding the cylinder. 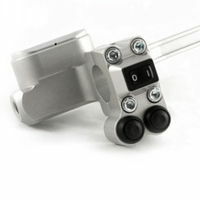 Can be supplied with optional single or double brake line banjo bolt and washers - with integral hydraulic brake light switch for road/street bikes (please select below). If you are building a special or simply want to clean up your handlebars, we have the unique range of ISR electrical switchgear - which very neatly bolts on to the back of your master cylinder (and/or cable clutch) replacing the original 4-bolt clamp, taking up less space. 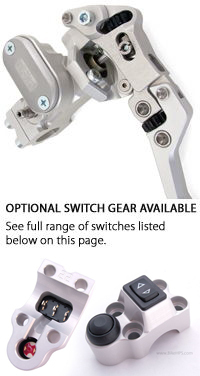 See full range of switches listed below on this page. !quote, braking, brakes, aprilia, 6.5, 10, 11, 12, 13, 14, 15, 16, 17, 18, 19, 20, 50, 53, 69, 70, 71, 72, 73, 74, 75, 76, 77, 78, 79, 80, 81, 82, 83, 85, 86, 87, 88, 89, 91, 92, 93, 94, 95, 96, 97, 98, 99, 100, 110, 120, 125, 180, 185, 200, 225, 250, 300, 305, 350, 360, 380, 400, 426, 450, 500, 504, 525, 530, 550, 570, 600, 620, 625, 640, 644, 650, 660, 664, 690, 695, 700, 748, 749, 750, 850, 800, 851, 865, 883, 888, 900, 906, 907, 916, 920, 950, 955, 959, 990, 996, 998, 999, 1000, 1050, 1098, 1100, 1200, 1300, 1400, 1800, 1969, 1970, 1971, 1972, 1973, 1974, 1975, 1977, 1978, 1979, 1980, 1981, 1982, 1983, 1984, 1985, 1986, 1987, 1988, 1989, 1991, 1992, 1993, 1994, 1995, 1996, 1997, 1998, 1999, 2000, 2001, 2002, 2003, 2004, 2005, 2006, 2007, 2008, 2009, 2010, 2011, 2012, 2013, 2014, 2015, 2016, 2017, 2018, 2019, 2020, 1000DB5, 1000ds, 1000R, 1000ss, 1050st, 10r, 1100s, 1200c, 1200s, 1200ts, 125ex, 125exc, 125sx, 12r, 200sx, 250et, 250exc, 250r, 250rsb, 2d, 380sx, 3d, 400exc, 400ss, 450sx, 500sl, 500ss, 525exc, 525sx, 530exc, 550fc, 600sl, 600ss, 600tl, 625smc, 650gt, 65sx, 660smc, 690sm, 748r, 750c, 750DB1, 750f2, 750k2, 750k6, 750s, 750ss, 800ss, 85sx, 860gt, 860gts, 860mhr, 883r, 900s2, 900sd, 900sl, 900ss, 950sm, 955i, 990smr, 990smt, 996r, 998r, 999s, abs, ace, ad, adiva, adventure, adventurer, aerox, af1, america, AF1 50, af1-125, af1-250, agility, agusta, ala, alazzura, aluzzura, an400, anf125i, antidive, ap50, Aprilia, ar125, ar50, aspencade, atc250r, ate, augusta, b-whizz, b1h, b2, bad, bandit, bellaria, benelli, beta, big, bigwheel, bimota, biposta, Biposto, bj250, bking, blu, blue, blues, bmw, bob, bol, bold'or, bonneville, boy, breva, bros, bt1100, buell, bull, bulldog, bultaco, bundy, bws, c1h, c2, café, cagiva, california, caliper, canyon, Caponord, cat, cb, cb1, cb1000, cb1000r, cb1000sf, cb1100, cb1100rc, cb1100rd, cb1100sf, cb125, cb125t, cb1300, cb1300f, cb1300s, cb1400, cb250n, cb250r, cb350s, cb360, cb400, cb400f, cb400n, cb400sf, cb400t, cb450, cb450dx, cb500, cb500t, cb500v, cb550, cb550f, cb550k, cb600, cb600f, cb650, cb750f, cb750k, cbf1000f, cbf500, cbf600, cbr1000f, cbr1000rr, cbr1100xx, cbr125r, cbr250, cbr400r, cbr400rr, cbr600fs, cbr600fx, cbr600rr, cbr750, cbx1000, cbx250r, cbx550f, cbx750f, ccm, cg125, city, cj250t, clr125, comet, commando, conv, corsa, cr125, cr125r, cr250, cr500, cr80, crf150r, crf230f, crf250r, crf250x, crf450r, crf450x, crf1000l, crm250, cross, cs, ct, custom, cw50, cx500, cx650, cx650e, cyclone, cygnus, d2e, dakar, darmah, davidson, davison, daytona, db1, DB2, DB3, DB4, db5, DB6, DB7, dc, deauville, delux, deluxe, desert, desmosedici, diversion, dl, dl1000, dl650, dn-01, dn01, dna125, dna50, dog, dor, Dorsoduro, douglas, dr, dr-z400sm, dr125, dr125s, dr350s, dr600r, dr600s, dr650rs, dr750s, dragstar, dragster, drz, drz400sm, ds1000, dt, dt125r, dt125s, dual, ducati, duke, dx, dxb, dxd, dylan, dyna, easy, ec200, ec250, ec300, edition, efe, el250, el252, elefant, eliminator, elyseo, en, en450, enduro, enfield, er-5, er-6f, er250, er5, er500, er6f, esd, ese, estrella, et, ETV1000, euro, european, eurosport, evolution, ex, ex305, executive, explorer, extrema, exup, f1, f2, f4s, f650, f650gs, f6c, f800s, faired, falco, fazer, fc, fes125, fighter, fii, fj1100, fj1200a, fjr1300, flhc, flhr, flhs, flhtc, flhtc-u, flst, flstc, flstf, flstn, fltc, fltc-u, fltri, fly, fmx, fmx650, formula, forza, four, free, freewind, fs1e, ft500c, fu, fun, fur, Furano, futura, fw, fwdd, fx, fx125, fxd, fxdb, fxdl, fxds-c, fxdwg, fxdx, fxe, fxef, fxlr, fxr, fxr180, fxr180sp, fxrs, fxrs-sp, fxrt, fxsb, fxst, fxstb, fxstc, fxsts, fxstsb, fxwg, fz, fz1, fz1-s, fz400, fz6, gamma, fz750, fz8, fzr, fzr1000, fzr1000r, fzr400, fzr400rr, fzr600r, fzr750r, fzs1000, fzs600, gas, gasgas, genesis, gfr, gfr125, gilera, gl1100a, gl1200a, gl1500j, gl500, gle650, glide, glph, glpv, gn, gold, goldwing, goose, gp100x, gp125, gp125d, gp125n, gp125x, gpa1, gpx600rc, gpx750r, gpz, gpz1100, gpz1100s, gpz305, gpz500, gpz600r, gpz750, gpz900r, gran, gs, gs1000en, gs1000et, gs1000g, gs125e, gs125s, gs250tt, gs400, gs425, gs500e, gs500f, gs550, gs550en, gs550et, gs650, gs650g, gs750b, gs750db, gs850g, gsf, gsf1200, gsf1200sa, gsf1250, gsf1250sa, gsf400, gsf600, gsf650, gsgd, gsm, gsm50, gsr, gsr600, gsx-r1100, gsx-r1300, gsx-r400, gsx-r400rr, gsx-r600, gsx1000s, gsx1100, gsx1100e, gsx1100f, gsx1100g, gsx1100sd, gsx1400, gsx250, gsx250e, gsx400, gsx400e, gsx550ef, gsx550es, gsx600, gsx600fw, gsx650f, gsx750, gsx750e, gsx750f, gsx750sf, gsx750w, gsxr, gsxr1000, gsxr1100, gsxr400, gsxr400rr, gsxr600, gsxr750, gt, gt125, gt185, gt250, gt250r, gt380, gt500, gt550, gt650, gt650r, gt750, gtd, gtr1000, gts, gts1000, gtx, guzzi, gv650, gz125, h1f, half, harley, harley-davidson, harley-davison, hawk, hd, honda, hornet, hugger, husaberg, husqvana, Husqvarna, hyosung, hypermotard, ID, ie, ii, iii, imp, import, indiana, Iniezione, injection, innova, intruder, italijet, japanese, jota, jps, k1, k10, k100, k100r, k100rs, k100rt, k1100, k1200, k1200rs, k2, k3, k4, k5, k6, k7, k75, k75-s, k75c, k75s, k8, k9, katana, kawasaki, kb1, kdx200, kh100g, kh125, kh250, kh400, kh500, kl650, kle500, klr250, klr600, klv1000, klx110, klx300, klx400, klx450r, klx650, kmx125, kmx450, kr1, kr1s, kr250, ks, ks500c, ksr, ktm, kx100, kx125, kx250, kx250f, kx450f, kx500, kx65, kx85, kymco, kz1000, kz1300, kz400, kz650, l0, l1, l2, lambretta, lario, laverda, lawson, lc, lc4, lc8, le, le mans, lemans, light, lightning, limited, linked, lmf, low, lowrider, ls, ls650, lt, ltd, m1000, m1600, m1800r, m2, m400, m600, marauder, m620, m750, m800, m900, m900ms4s, machismo, magna, maico, majesty, mana, mans, Mantra, master, mbx125rw, mbx80f, mc19, mc21, mc22, mc28, mean, meanstreak, mhr, Moto, midnight, mille, mirage, mistral, mito, mk1, mk2, mkii, monster, montjuic, morini, motard, motocross, mt-01, mt-03, mt01, mt03, mtx125rwf, mtx200rwd, multistrada, mv, naked, nc21, nc23, nc24, nc27, nc29, nc30, nc31, nc35, newton, ng, night, nighthawk, nighttrain, ninja, nord, ns125r, nsr250r, nsr250sp, ntv600-j, ntv600j, ntv650, ntv700v, nx650, nxc, nxc125, ocean, one, pacific, pan, pantah, pantheon, paris, paso, paul, pc800, pegaso, people, peugeot, piaggio, planet, prima, ps125i, px, quad, quadrunner, quasar, r1, r100, r100cs, r100gs, r100rg, r100rs, r100rt, r100t, r1100gs, r1100r, r1100rs, r1100rt, r1100s, r1150, r1150gs, r1150r, r2, r30, r45, r6, r65, r65ls, r75, r76, r80, r80gs, r80rt, r80st, r87, r90, r90s, racer, racing, raider, raptor, rc, rc51, rc8, rd, rd125, rd125lc, rd200, rd250, rd350, rd400, rd500, replacing, replica, retro, revere, rf, rf600r, rf900r, rf900rr, rg, rg125f, rg250, rg500, RG80, rga, rgs, rgv, rgv250, rj250, rm250, rm80, rmx, rmx250, rmz, rmz250, rmz450, road, road star, roadstar, RS250, roadster, rocket, rossi, rotary, rotax, rrk, rrn, rrsp, rs, rs100, rs125, rs16, rs18, rs50, rs900, rsb, rst, rst1000, rsv, rsv-r, rsv-sp, rsv1000, RSV4, rsvr1000, rt, runner, rvf750r, rx1000, rx50, RXV450, RXV550, rz250, s1, s2, s2r, s3, s4, s4s, sa, sachs, saturno, sauber, savage, SB6, SB7, SB8, sc, scorpion, scrambler, sd, sdr200, sei, sernow, ses125, sfc, sh125i, sh300i, shadow, Shiver, silver, silverwing, single, sixteen, ske, skx, sl1000, SL750, slingshot, slkx, slr650, slr650v, slung, smart, smc, softail, sp, sp1, sp1000, sp1000nt, sp2, sp3, spada, speed, speed fight, speedfight, speedmaster, spirit, sport, sports, sportster, springer, sprint, sps, sr250, sr50, sr500, srv250, srx600, ss, ss50, st, st1100, st1300, st2, st3, st4, standard, star, strada, streak, street, streetbob, strike, sugomi, super, super tenere, superbike, supercity, superdream, superduke, superfour, superglide, superlight, Supermono, supermotard, supermoto, supersport, suzuki, sv, sv650, sv650s, sxv, sxv450, sxv550, sz, szr660, t-max, t100, t140d, t140v, t3, t4, t5, t509, t595, targa, tbird, tc, tc570, td, tdm, tdm850, tdm900, tdr125, tdr250, tema, tenere, Tesi, Tesi2D, Tesi3D, thruxton, thunder, thunderace, thunderbird, thundercat, tiger, tl, tl1000, tl1000r, tl1000s, tm, tnt, tour, tourer, tr, tr1, trail, train, transalp, trial, Tuono, tricolore, triple, triumph, trophy, trx, trx850, ts125, tss, tsx, tt, tt-r250, tt600, tu250, Tuareg, tuatara, v-strom, turbo, twin, twindisc, tx, tx350e, tz125, tz250, van van, tzr, tzr125, unfaired, us, V-Due, v-max, v-rod, v-tec, v35, V4R, v50, v65, valkyrie, valve, vanvan, varadero, vdue, venture, versys, vespa, vf1000fe, vf1000fr, vf1100, vf400f, vf500f, vf700c, vf750c, vf750f, vfr400r, vfr750f, vfr800f, vl125, vl1500, vmax, vn1500, vn1600, vn2000, vn800, vn900, volty, vrod, vs, vs1600, vs600, vs750, vs800, vstrom, vt1100, vt250f, vt500e, vt750c, vt750dc, vt800, vtec, vtr1000, vtr1000f, vtr250, wind, vtx1300, vtx1800, vulcan, vx800, vz1600, vz800, vz850, w650, warrior, west, wheel, white, whizz, wide, wideglide, wildstar, wing, wr, wr250, wr250r, wr250x, wr360, wr426f, wr450f, x-city, x-max, x1, x11, x4, xb12r, xb12s, xb9sx, xbr500f, xcity, xf650, xj550, xj600, xj650, xj750, xj900, xjr1200, xjr1300, xjr400, xl, xl1000v, xl1200c, xl1200s, xl125rf, xl125rt, xl125v, xl53c, xl600, xl600r, xl600v, xl650v, xl700v, xlh, xls, xls1000, xlv1000, xn85, xp500, xr, xr125l, xr250r, xr400r, xr400rv, xr650, xrv750, xs, xs1100, xs1100s, xs250s, xs400se, xs500c, xs650, xs650c, xs650e, xs750, xs750se, xs850, xt, xt125, xt125r, xt225, xt250, xt350, xt500, xt600, xt600z, xt660r, xt660x, xt660z, xtc125, xv1000, xv1100, xv125s, xv1600, xv1700, xv1900, xv1900a, xv750se, xv920, xvs1100, xvs650a, xvz12td, xz550, xz550s, yamaha, YB11, YB4, YB5, YB6, YB7, YB8, YB9, ybr, ybr125, yp125r, yp250, ypvs, yz125, yz250, yz250f, yz426, yz450f, yz85, yzf-r1, yzf-r125, yzf-r6, yzf-r7, yzf1000, yzf250, yzf600, yzf750r, yzfr, yzfr125, yzfr6, yzfr7, z1000, z1000k, z1300, z1a, z1b, z1r, z250, z250t, z400, z400f, z440, z450, z500, z550, z650, z750, z750b, z750ct, z750e, z750s, z900, zephyr, zg1000, zg1300, zip, zl1000, zl1100, zl600, zr-7, zr-7s, zr400, zr50, zr550, zr7, zr750, zr7s, zrx1100, zrx1200r, zrx1200s, zx-10r, zx-12r, zx-6r, zx-7r, zx-9r, zx10, zx1000, zx10r, zx1200, zx12r, zx14, zx6r, zx6rr, zx7r, zx7rr, zx9r, zxr, zxr400, zxr750r, zzr, zzr1100, zzr1200, zzr1400, zzr250, zzr400, zzr600! It was a pleasant surprise to receive the ISR components so quickly. The parts all look to be superb quality. Thanks for all your help on this. The adjustable lever ratio means that you can tailor the feel of your front brakes exactly to suit your preference. !braking, brakes, dyna, softail, sportster, touring, 883, 1200, sportsters, xl50, 50th, xl883n, xl883r, iron, xl883l, 883l, xl1200c, 1200c, xl1200x, 1200x, custom, superlow, low, xl1200v, 1200v, 48, 72, forty, eight, seventy, two, forty-eight, seventy-two, xl1200t, 1200t, nightster, xl1200n, 1200n, roadster, low, xl1200l 1200l, anniversary, xl1200r, 1200r, xl1200s, 1200s, sport, hugger, xl, xl883l, xlh, xlh883, xlh1200, softail, tail, fls, slim, flstci, heritage, classic, flstfi, fatboy, fat, boy, flstfb lo, flstfse, screaming, eagle, flstni, deluxe, flstsi, classic, springer, flst, flsts, flstsb, flstf, cross, bones, crossbones, flstsci, fxcwc, rocker, blackline, line, breakout, out, fxsb, fxsti, standard, fsxtb, fsxtbi, nighttrain, train, fxstc, custom, fxstd, deuce, fxstsse2, fxstsse3, FXDWG, FXDB, fxdb, wide, glide, wideglide, street, bob, streetbob, FXDC, superglide, custom, FXDF, fatbob, bob, switchback, FLD, FXDL, lowrider, rider, custom, screaming, eagle, superglide, fxdli, fxdbi, fxdci, fxdwgi, fxdxi, fxdxt, convetible, sport, anniversary, 35th, t-sport, tourers, flhrc, road, king, roadking, street, glide, streetglide, roadglide, flhxse, flhtkse, flhri, flhtci, cvo, flhtkl, special, ultra, limited, flhtcul, flhtcui, flhrci, fllhri, classic, electra, special, low, flhtcutg, tri, freewheeler, wheeler, fltrx, fltru, king, screamin, screaming, eagles, standard! 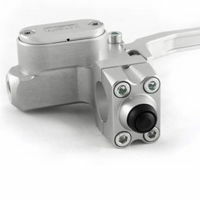 For those who fit an ISR Brake Master Cylinder and want a matching cable clutch lever unit or for those who simply need to adjust the span of their cable clutch lever - this is THE product. If you are building a special or simply want to clean up your handlebars, we have the unique range of ISR electrical switchgear - which very neatly bolts on to the back of your cable clutch (and/or master cylinder) replacing the original 4-bolt clamp, taking up less space. 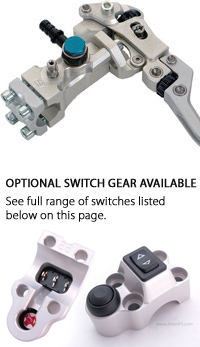 See full range of switches listed below on this page. 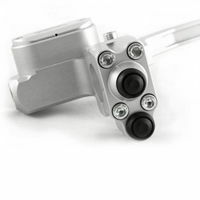 Weighing in at only 420 Grammes and machined from billet aluminium, this master cylinder is suitable for both road and racing bikes. The 14mm bore suits the twin piston fixed or large single piston floating rear calipers found on virtually all motorcycles. 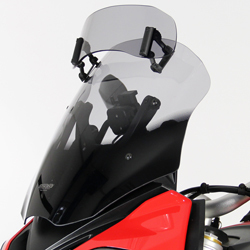 Its neat sealed remote reservoir is designed to be easily replaced if damaged in a crash - it also looks trick as well! 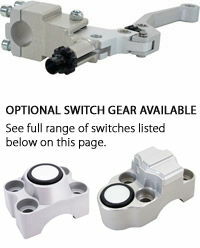 ISR have created a number of handlebar clamp switch assemblies. 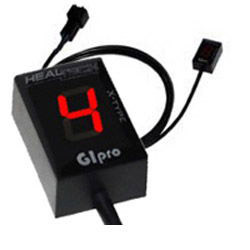 These fit any of the ISR master cylinder or clutch levers and can be wired to your custom functions. OR... 2 push buttons only (see below). 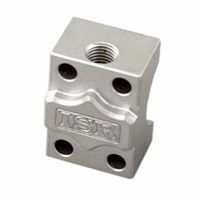 These non-radial master cylinders from ISR are an ideal upgrade for retro or custom bikes. Machined from billet aluminium and incorporating many unique design features, these work as good as they look. The adjustable leverage feature means that you can tailor the feel of your front brakes to suit your preference. This version features 2 push buttons. Available for 22mm or 25.4mm bars. This version features 1 Sliding Switch and 2 push buttons. Please note: 2 switches are pictured to illustrate the difference between left and right sided, only one switch will be supplied. 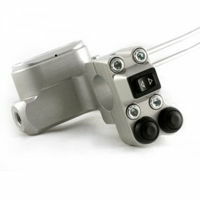 To enable you to put the perfect finishing touches to your special - or simply clean up your handlebars and save space - we have a number of very neat and functional handlebar Clamp Switch Assemblies. These fit any of the ISR master cylinder or clutch levers (including the Cable Clutch) and can be wired to your preferred functions. This version features 1 push button - which could be used for Starter or Horn, etc. 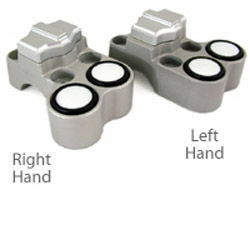 - and is suitable for both left or right hand fitments. Max. Current is 25mA for Push Buttons, meaning relays may be required for some applcations. Available for 22mm (7/8") or 25.4 mm (1") bars - please choose below when ordering. 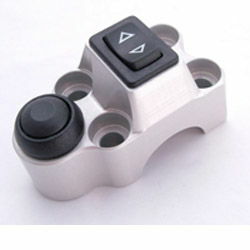 Left & Right Hand 22mm - 7/8"
Left & Right Hand 25.4mm - 1"
This version features one on-off-on Rocker Switch and two Push Buttons - which could be used for Indicators, Starter or Horn, etc. 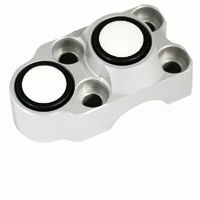 - and is available in 22mm (7/8"), 25.4mm (1") versions and left and right handed fitments. Max. Current for Rocker Switches is 6A and 25mA for Push Buttons, meaning relays may be required for some applcations. !quote, aprilia, 6.5, 10, 11, 12, 50, 53, 69, 70, 71, 72, 73, 74, 75, 76, 77, 78, 79, 80, 81, 82, 83, 85, 86, 87, 88, 89, 91, 92, 93, 94, 95, 96, 97, 98, 99, 100, 110, 120, 125, 180, 185, 200, 225, 250, 300, 305, 350, 360, 380, 400, 426, 450, 500, 504, 525, 530, 550, 570, 600, 620, 625, 640, 644, 650, 660, 664, 690, 695, 700, 748, 749, 750, 850, 800, 851, 865, 883, 888, 900, 906, 907, 916, 920, 950, 955, 959, 990, 996, 998, 999, 1000, 1050, 1098, 1100, 1200, 1300, 1400, 1800, 1969, 1970, 1971, 1972, 1973, 1974, 1975, 1977, 1978, 1979, 1980, 1981, 1982, 1983, 1984, 1985, 1986, 1987, 1988, 1989, 1991, 1992, 1993, 1994, 1995, 1996, 1997, 1998, 1999, 2000, 2001, 2002, 2003, 2004, 2005, 2006, 2007, 2008, 2009, 2010, 2011, 2012, 1000DB5, 1000ds, 1000R, 1000ss, 1050st, 10r, 1100s, 1200c, 1200s, 1200ts, 125ex, 125exc, 125sx, 12r, 200sx, 250et, 250exc, 250r, 250rsb, 2d, 380sx, 3d, 400exc, 400ss, 450sx, 500sl, 500ss, 525exc, 525sx, 530exc, 550fc, 600sl, 600ss, 600tl, 625smc, 650gt, 65sx, 660smc, 690sm, 748r, 750c, 750DB1, 750f2, 750k2, 750k6, 750s, 750ss, 800ss, 85sx, 860gt, 860gts, 860mhr, 883r, 900s2, 900sd, 900sl, 900ss, 950sm, 955i, 990smr, 990smt, 996r, 998r, 999s, abs, ace, ad, adiva, adventure, adventurer, aerox, af1, america, AF1 50, af1-125, af1-250, agility, agusta, ala, alazzura, aluzzura, an400, anf125i, antidive, ap50, Aprilia, ar125, ar50, aspencade, atc250r, ate, augusta, b-whizz, b1h, b2, bad, bandit, bellaria, benelli, beta, big, bigwheel, bimota, biposta, Biposto, bj250, bking, blu, blue, blues, bmw, bob, bol, bold'or, bonneville, boy, breva, bros, bt1100, buell, bull, bulldog, bultaco, bundy, bws, c1h, c2, café, cagiva, california, caliper, canyon, Caponord, cat, cb, cb1, cb1000, cb1000r, cb1000sf, cb1100, cb1100rc, cb1100rd, cb1100sf, cb125, cb125t, cb1300, cb1300f, cb1300s, cb1400, cb250n, cb250r, cb350s, cb360, cb400, cb400f, cb400n, cb400sf, cb400t, cb450, cb450dx, cb500, cb500t, cb500v, cb550, cb550f, cb550k, cb600, cb600f, cb650, cb750f, cb750k, cbf1000f, cbf500, cbf600, cbr1000f, cbr1000rr, cbr1100xx, cbr125r, cbr250, cbr400r, cbr400rr, cbr600fs, cbr600fx, cbr600rr, cbr750, cbx1000, cbx250r, cbx550f, cbx750f, ccm, cg125, city, cj250t, clr125, comet, commando, conv, corsa, cr125, cr125r, cr250, cr500, cr80, crf150r, crf230f, crf250r, crf250x, crf450r, crf450x, crf1000l, crm250, cross, cs, ct, custom, cw50, cx500, cx650, cx650e, cyclone, cygnus, d2e, dakar, darmah, davidson, davison, daytona, db1, DB2, DB3, DB4, db5, DB6, DB7, dc, deauville, delux, deluxe, desert, desmosedici, diversion, dl, dl1000, dl650, dn-01, dn01, dna125, dna50, dog, dor, Dorsoduro, douglas, dr, dr-z400sm, dr125, dr125s, dr350s, dr600r, dr600s, dr650rs, dr750s, dragstar, dragster, drz, drz400sm, ds1000, dt, dt125r, dt125s, dual, ducati, duke, dx, dxb, dxd, dylan, dyna, easy, ec200, ec250, ec300, edition, efe, el250, el252, elefant, eliminator, elyseo, en, en450, enduro, enfield, er-5, er-6f, er250, er5, er500, er6f, esd, ese, estrella, et, ETV1000, euro, european, eurosport, evolution, ex, ex305, executive, explorer, extrema, exup, f1, f2, f4s, f650, f650gs, f6c, f800s, faired, falco, fazer, fc, fes125, fighter, fii, fj1100, fj1200a, fjr1300, flhc, flhr, flhs, flhtc, flhtc-u, flst, flstc, flstf, flstn, fltc, fltc-u, fltri, fly, fmx, fmx650, formula, forza, four, free, freewind, fs1e, ft500c, fu, fun, fur, Furano, futura, fw, fwdd, fx, fx125, fxd, fxdb, fxdl, fxds-c, fxdwg, fxdx, fxe, fxef, fxlr, fxr, fxr180, fxr180sp, fxrs, fxrs-sp, fxrt, fxsb, fxst, fxstb, fxstc, fxsts, fxstsb, fxwg, fz, fz1, fz1-s, fz400, fz6, gamma, fz750, fz8, fzr, fzr1000, fzr1000r, fzr400, fzr400rr, fzr600r, fzr750r, fzs1000, fzs600, gas, gasgas, genesis, gfr, gfr125, gilera, gl1100a, gl1200a, gl1500j, gl500, gle650, glide, glph, glpv, gn, gold, goldwing, goose, gp100x, gp125, gp125d, gp125n, gp125x, gpa1, gpx600rc, gpx750r, gpz, gpz1100, gpz1100s, gpz305, gpz500, gpz600r, gpz750, gpz900r, gran, gs, gs1000en, gs1000et, gs1000g, gs125e, gs125s, gs250tt, gs400, gs425, gs500e, gs500f, gs550, gs550en, gs550et, gs650, gs650g, gs750b, gs750db, gs850g, gsf, gsf1200, gsf1200sa, gsf1250, gsf1250sa, gsf400, gsf600, gsf650, gsgd, gsm, gsm50, gsr, gsr600, gsx-r1100, gsx-r1300, gsx-r400, gsx-r400rr, gsx-r600, gsx1000s, gsx1100, gsx1100e, gsx1100f, gsx1100g, gsx1100sd, gsx1400, gsx250, gsx250e, gsx400, gsx400e, gsx550ef, gsx550es, gsx600, gsx600fw, gsx650f, gsx750, gsx750e, gsx750f, gsx750sf, gsx750w, gsxr, gsxr1000, gsxr1100, gsxr400, gsxr400rr, gsxr600, gsxr750, gt, gt125, gt185, gt250, gt250r, gt380, gt500, gt550, gt650, gt650r, gt750, gtd, gtr1000, gts, gts1000, gtx, guzzi, gv650, gz125, h1f, half, harley, harley-davidson, harley-davison, hawk, hd, honda, hornet, hugger, husaberg, husqvana, Husqvarna, hyosung, hypermotard, ID, ie, ii, iii, imp, import, indiana, Iniezione, injection, innova, intruder, italijet, japanese, jota, jps, k1, k10, k100, k100r, k100rs, k100rt, k1100, k1200, k1200rs, k2, k3, k4, k5, k6, k7, k75, k75-s, k75c, k75s, k8, k9, katana, kawasaki, kb1, kdx200, kh100g, kh125, kh250, kh400, kh500, kl650, kle500, klr250, klr600, klv1000, klx110, klx300, klx400, klx450r, klx650, kmx125, kmx450, kr1, kr1s, kr250, ks, ks500c, ksr, ktm, kx100, kx125, kx250, kx250f, kx450f, kx500, kx65, kx85, kymco, kz1000, kz1300, kz400, kz650, l0, l1, l2, lambretta, lario, laverda, lawson, lc, lc4, lc8, le, le mans, lemans, light, lightning, limited, linked, lmf, low, lowrider, ls, ls650, lt, ltd, m1000, m1600, m1800r, m2, m400, m600, marauder, m620, m750, m800, m900, m900ms4s, machismo, magna, maico, majesty, mana, mans, Mantra, master, mbx125rw, mbx80f, mc19, mc21, mc22, mc28, mean, meanstreak, mhr, Moto, midnight, mille, mirage, mistral, mito, mk1, mk2, mkii, monster, montjuic, morini, motard, motocross, mt-01, mt-03, mt01, mt03, mtx125rwf, mtx200rwd, multistrada, mv, naked, nc21, nc23, nc24, nc27, nc29, nc30, nc31, nc35, newton, ng, night, nighthawk, nighttrain, ninja, nord, ns125r, nsr250r, nsr250sp, ntv600-j, ntv600j, ntv650, ntv700v, nx650, nxc, nxc125, ocean, one, pacific, pan, pantah, pantheon, paris, paso, paul, pc800, pegaso, people, peugeot, piaggio, planet, prima, ps125i, px, quad, quadrunner, quasar, r1, r100, r100cs, r100gs, r100rg, r100rs, r100rt, r100t, r1100gs, r1100r, r1100rs, r1100rt, r1100s, r1150, r1150gs, r1150r, r2, r30, r45, r6, r65, r65ls, r75, r76, r80, r80gs, r80rt, r80st, r87, r90, r90s, racer, racing, raider, raptor, rc, rc51, rc8, rd, rd125, rd125lc, rd200, rd250, rd350, rd400, rd500, replacing, replica, retro, revere, rf, rf600r, rf900r, rf900rr, rg, rg125f, rg250, rg500, RG80, rga, rgs, rgv, rgv250, rj250, rm250, rm80, rmx, rmx250, rmz, rmz250, rmz450, road, road star, roadstar, RS250, roadster, rocket, rossi, rotary, rotax, rrk, rrn, rrsp, rs, rs100, rs125, rs16, rs18, rs50, rs900, rsb, rst, rst1000, rsv, rsv-r, rsv-sp, rsv1000, RSV4, rsvr1000, rt, runner, rvf750r, rx1000, rx50, RXV450, RXV550, rz250, s1, s2, s2r, s3, s4, s4s, sa, sachs, saturno, sauber, savage, SB6, SB7, SB8, sc, scorpion, scrambler, sd, sdr200, sei, sernow, ses125, sfc, sh125i, sh300i, shadow, Shiver, silver, silverwing, single, sixteen, ske, skx, sl1000, SL750, slingshot, slkx, slr650, slr650v, slung, smart, smc, softail, sp, sp1, sp1000, sp1000nt, sp2, sp3, spada, speed, speed fight, speedfight, speedmaster, spirit, sport, sports, sportster, springer, sprint, sps, sr250, sr50, sr500, srv250, srx600, ss, ss50, st, st1100, st1300, st2, st3, st4, standard, star, strada, streak, street, streetbob, strike, sugomi, super, super tenere, superbike, supercity, superdream, superduke, superfour, superglide, superlight, Supermono, supermotard, supermoto, supersport, suzuki, sv, sv650, sv650s, sxv, sxv450, sxv550, sz, szr660, t-max, t100, t140d, t140v, t3, t4, t5, t509, t595, targa, tbird, tc, tc570, td, tdm, tdm850, tdm900, tdr125, tdr250, tema, tenere, Tesi, Tesi2D, Tesi3D, thruxton, thunder, thunderace, thunderbird, thundercat, tiger, tl, tl1000, tl1000r, tl1000s, tm, tnt, tour, tourer, tr, tr1, trail, train, transalp, trial, Tuono, tricolore, triple, triumph, trophy, trx, trx850, ts125, tss, tsx, tt, tt-r250, tt600, tu250, Tuareg, tuatara, v-strom, turbo, twin, twindisc, tx, tx350e, tz125, tz250, van van, tzr, tzr125, unfaired, us, V-Due, v-max, v-rod, v-tec, v35, V4R, v50, v65, valkyrie, valve, vanvan, varadero, vdue, venture, versys, vespa, vf1000fe, vf1000fr, vf1100, vf400f, vf500f, vf700c, vf750c, vf750f, vfr400r, vfr750f, vfr800f, vl125, vl1500, vmax, vn1500, vn1600, vn2000, vn800, vn900, volty, vrod, vs, vs1600, vs600, vs750, vs800, vstrom, vt1100, vt250f, vt500e, vt750c, vt750dc, vt800, vtec, vtr1000, vtr1000f, vtr250, wind, vtx1300, vtx1800, vulcan, vx800, vz1600, vz800, vz850, w650, warrior, west, wheel, white, whizz, wide, wideglide, wildstar, wing, wr, wr250, wr250r, wr250x, wr360, wr426f, wr450f, x-city, x-max, x1, x11, x4, xb12r, xb12s, xb9sx, xbr500f, xcity, xf650, xj550, xj600, xj650, xj750, xj900, xjr1200, xjr1300, xjr400, xl, xl1000v, xl1200c, xl1200s, xl125rf, xl125rt, xl125v, xl53c, xl600, xl600r, xl600v, xl650v, xl700v, xlh, xls, xls1000, xlv1000, xn85, xp500, xr, xr125l, xr250r, xr400r, xr400rv, xr650, xrv750, xs, xs1100, xs1100s, xs250s, xs400se, xs500c, xs650, xs650c, xs650e, xs750, xs750se, xs850, xt, xt125, xt125r, xt225, xt250, xt350, xt500, xt600, xt600z, xt660r, xt660x, xt660z, xtc125, xv1000, xv1100, xv125s, xv1600, xv1700, xv1900, xv1900a, xv750se, xv920, xvs1100, xvs650a, xvz12td, xz550, xz550s, yamaha, YB11, YB4, YB5, YB6, YB7, YB8, YB9, ybr, ybr125, yp125r, yp250, ypvs, yz125, yz250, yz250f, yz426, yz450f, yz85, yzf-r1, yzf-r125, yzf-r6, yzf-r7, yzf1000, yzf250, yzf600, yzf750r, yzfr, yzfr125, yzfr6, yzfr7, z1000, z1000k, z1300, z1a, z1b, z1r, z250, z250t, z400, z400f, z440, z450, z500, z550, z650, z750, z750b, z750ct, z750e, z750s, z900, zephyr, zg1000, zg1300, zip, zl1000, zl1100, zl600, zr-7, zr-7s, zr400, zr50, zr550, zr7, zr750, zr7s, zrx1100, zrx1200r, zrx1200s, zx-10r, zx-12r, zx-6r, zx-7r, zx-9r, zx10, zx1000, zx10r, zx1200, zx12r, zx14, zx6r, zx6rr, zx7r, zx7rr, zx9r, zxr, zxr400, zxr750r, zzr, zzr1100, zzr1200, zzr1400, zzr250, zzr400, zzr600! Received ISR parts today, very happy with them, cheers. This version features one On-Off-On Rocker Switch and one Push Button (Two Button Version Shown Here) - which could be used for Indicator, Starter or Horn, etc. 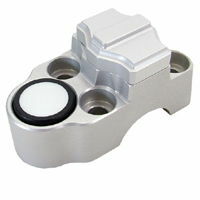 - and is suitable for both left or right hand fitments. Max. Current for Rocker Switches is 6A and 25mA for Push Buttons, meaning relays may be required for some applcations. !dyna, softail, sportster, touring, 883, 1200, sportsters, xl50, 50th, xl883n, xl883r, iron, xl883l, 883l, xl1200c, 1200c, xl1200x, 1200x, custom, superlow, low, xl1200v, 1200v, 48, 72, forty, eight, seventy, two, forty-eight, seventy-two, xl1200t, 1200t, nightster, xl1200n, 1200n, roadster, low, xl1200l 1200l, anniversary, xl1200r, 1200r, xl1200s, 1200s, sport, hugger, xl, xl883l, xlh, xlh883, xlh1200, softail, tail, fls, slim, flstci, heritage, classic, flstfi, fatboy, fat, boy, flstfb lo, flstfse, screaming, eagle, flstni, deluxe, flstsi, classic, springer, flst, flsts, flstsb, flstf, cross, bones, crossbones, flstsci, fxcwc, rocker, blackline, line, breakout, out, fxsb, fxsti, standard, fsxtb, fsxtbi, nighttrain, train, fxstc, custom, fxstd, deuce, fxstsse2, fxstsse3, FXDWG, FXDB, fxdb, wide, glide, wideglide, street, bob, streetbob, FXDC, superglide, custom, FXDF, fatbob, bob, switchback, FLD, FXDL, lowrider, rider, custom, screaming, eagle, superglide, fxdli, fxdbi, fxdci, fxdwgi, fxdxi, fxdxt, convetible, sport, anniversary, 35th, t-sport, tourers, flhrc, road, king, roadking, street, glide, streetglide, roadglide, flhxse, flhtkse, flhri, flhtci, cvo, flhtkl, special, ultra, limited, flhtcul, flhtcui, flhrci, fllhri, classic, electra, special, low, flhtcutg, tri, freewheeler, wheeler, fltrx, fltru, king, screamin, screaming, eagles, standard! This version features one On-Off Rocker Switch - which could be used for Lights on-off or Main Beam etc. 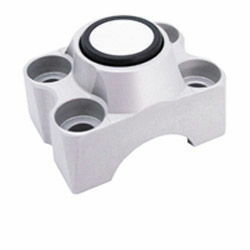 - and is suitable for both left or right hand fitments. Max. Current for Rocker Switches is 6A meaning relays may be required for some applcations. 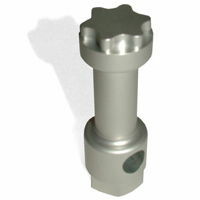 This version features one on-off Rocker Switch and two Push Buttons - which could be used for Indicators, Starter or Horn, etc. - and is available in 22mm (7/8"), 25.4mm (1") versions and left and right handed fitments. Max. Current for Rocker Switches is 6A and 25mA for Push Buttons, meaning relays may be required for some applcations. Mirror Mount made from billet Aluminium to compliment your existing ISR products. 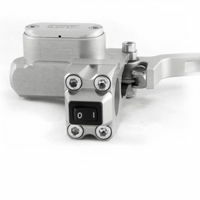 Simply replaces the existing clamp on your ISR Master Cylinder. Available to suit 22mm or 25.4mm diameter handlebars. Replacement blade section (up to the knurled span adjuster) for ISR radial brake/clutch master cylinders.